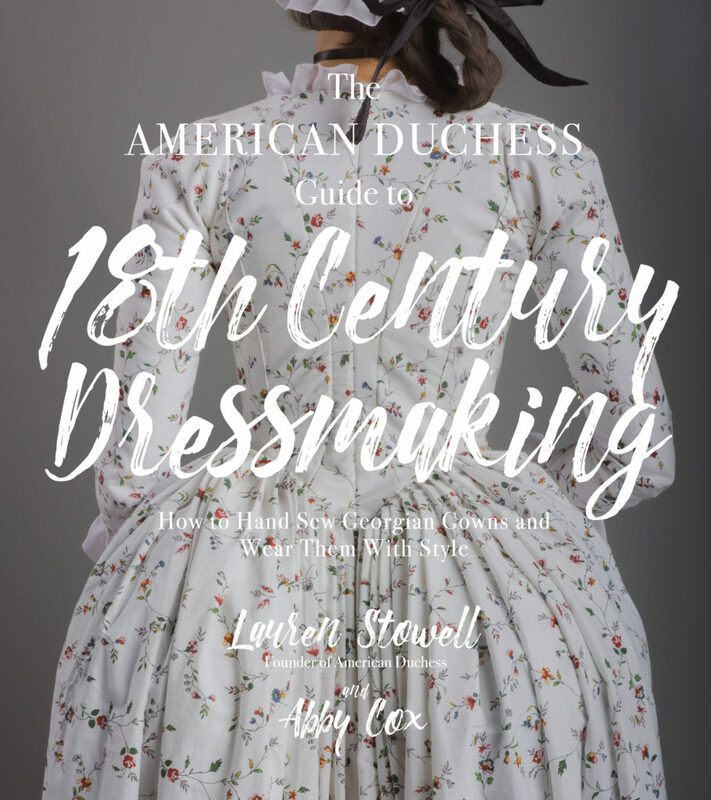 When I was contacted by the Page Street Publishing Company to review a copy of The American Duchess Guide to 18th Century Dressmaking, by Lauren Stowall and Abby Cox, I was excited! 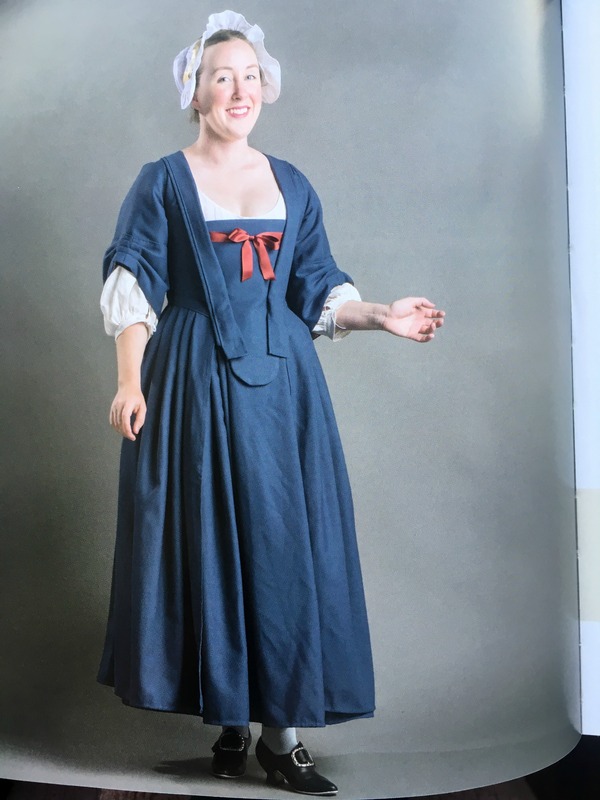 The American Duchess Guide To 18th Century Dressmaking demystifies the sewing techniques used in 18th Century fashion so even a beginner can get started in historical costuming. But it has enough in it to interest an expert as well. Although I’m not a historical sewing blogger, I’ve done my share of costuming when I worked at my local theater costuming plays. If only I had had more time and help to create historically correct costumes like they do on some big budget films! But it was not so with the minuscule budgets and time constraints of community theater. 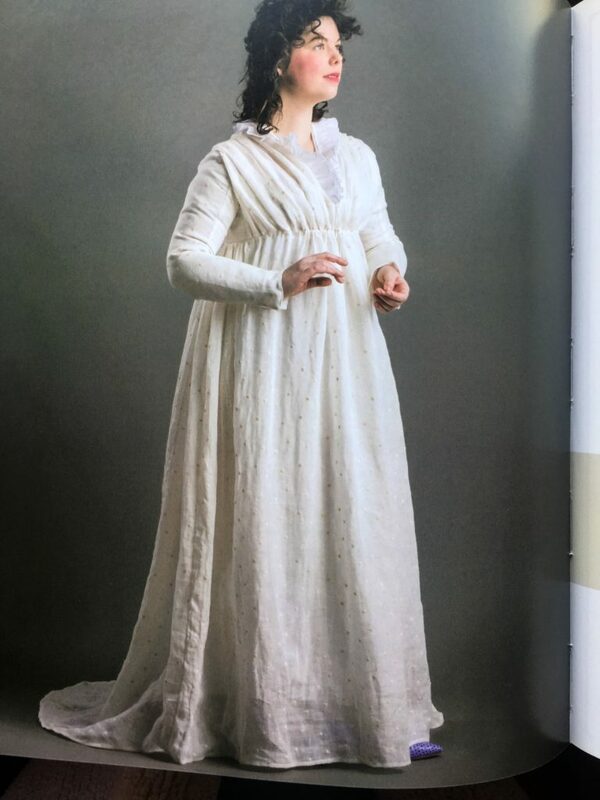 During my time at the theater, I became fascinated with a handful of historical costuming bloggers and the incredible amount of time and research that went into their garments. 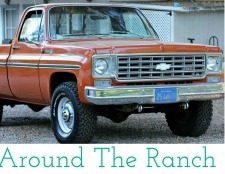 One of those blogs was The American Duchess written by Lauren Stowall. Lauren’s sumptuous photographs and gorgeous gowns look like something you would see in a museum. 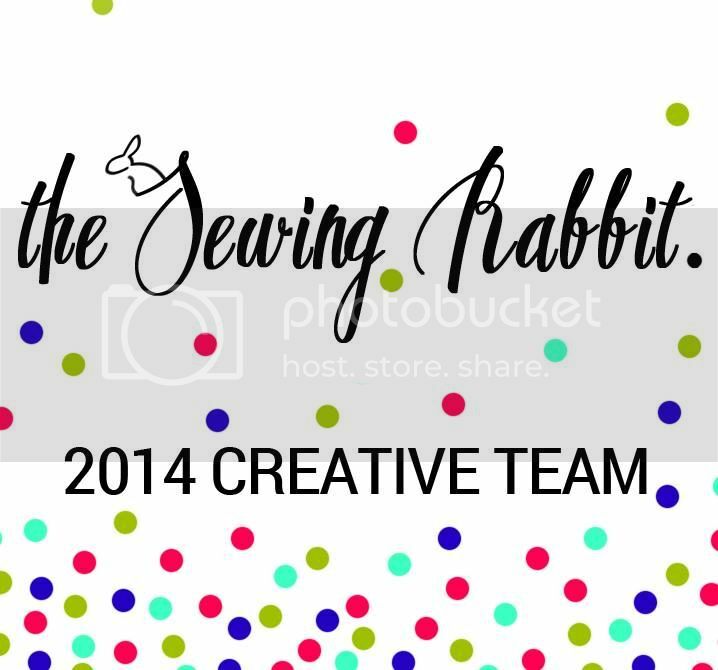 As well as running her blog ,creating sewing patterns for Simplicity, and writing a book, Lauren has a line of historically accurate footwear you can learn more about here. 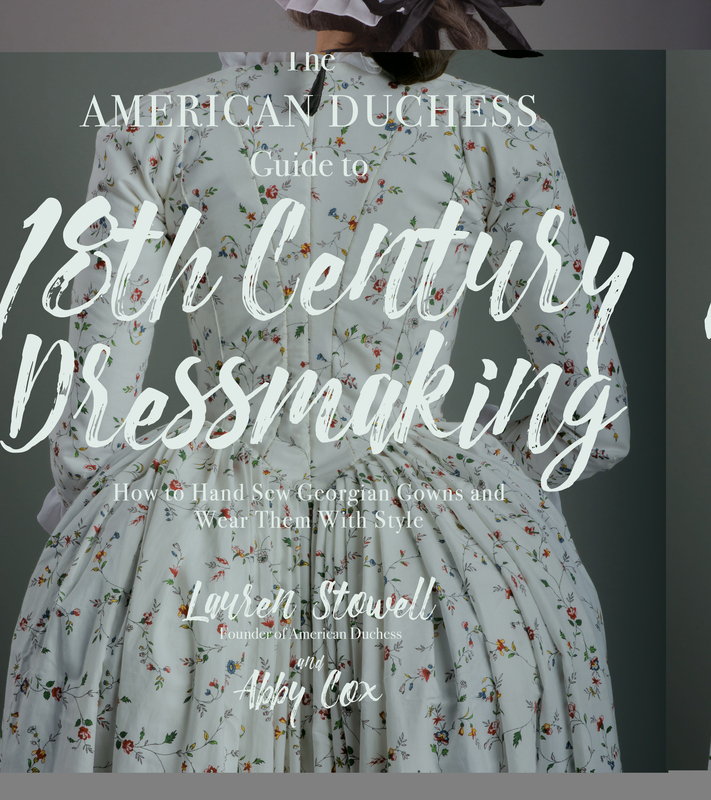 Her co author Abby Cox, Vice president of the American Duchess company, also writes for the blog, and models many of the dresses in the book, along with Lauren. The English Gown, The Sack Gown, the Italian Gown, and The Round Gown. Making an historically accurate 18th Century gown is truly a labor of love and a creation of artistry. The beautiful creations in this book and projects included are inspirational to the beginning as well as the advanced costumer, and the practical instructions make creating them possible. While patterns are not included, like many historical sewing books, there are gridded diagrams. The mantua maker of the 18th century didn’t use paper patterns. Instead, she would drape the design directly to the client or to the dress form. 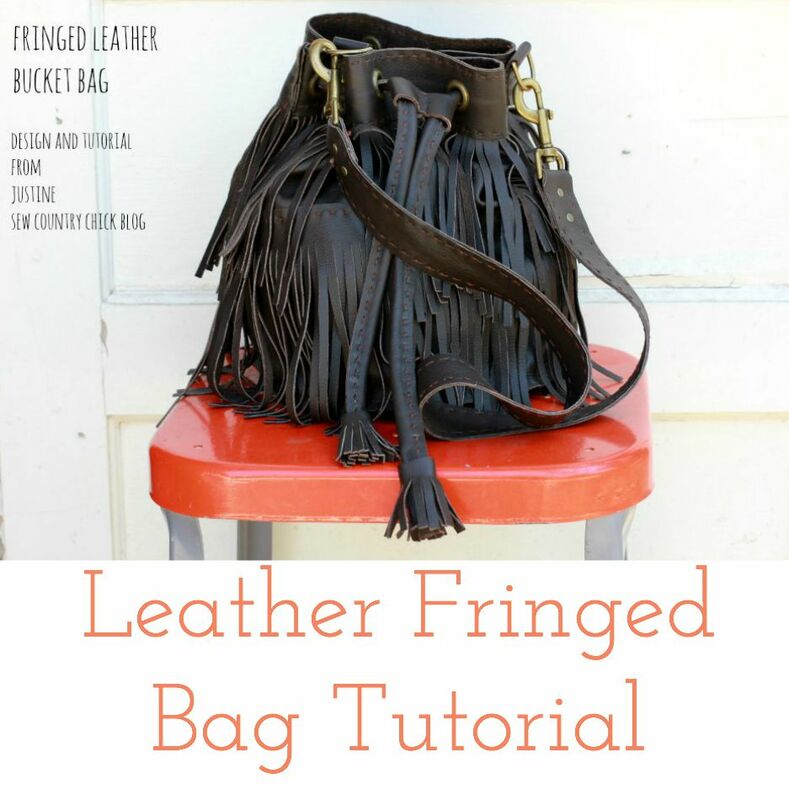 The draping method is explained very well, with lots of photos to guide the reader in the process. Enjoying draping myself, it looks a lot harder than it actually is. 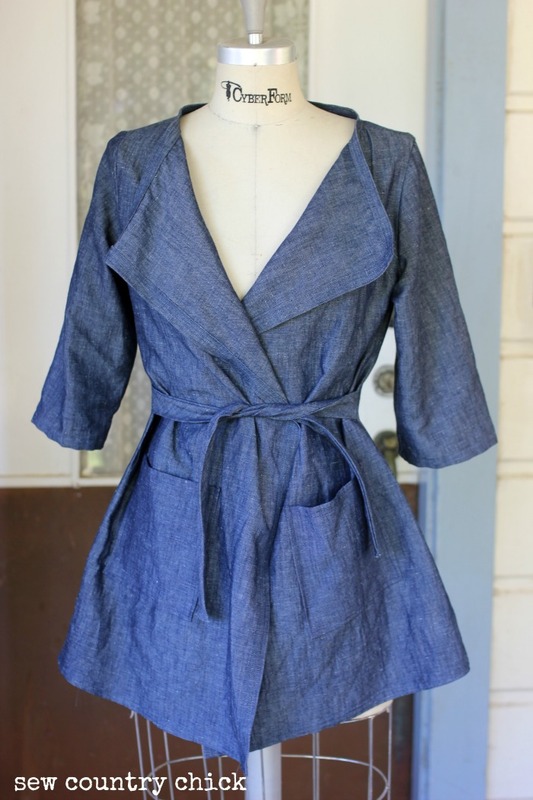 With the release of this book, Simplicity has collaborated with The American Duchess, and they now have some commercial sewing patterns available, so if one is too intimidated to try draping, they can buy the pattern and still follow along with the book. 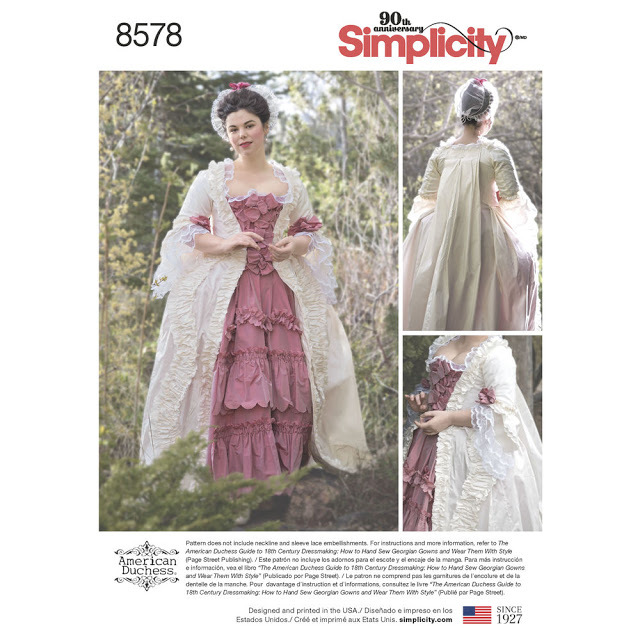 The Sacque gown and it’s underpinnings from the book is now available as Simplicity 8579 & 8578. 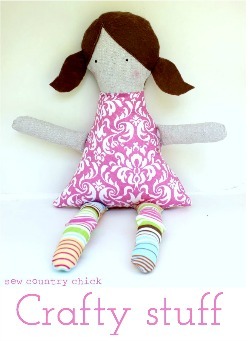 American Duchess also has other 18th Century patterns available through Simplicity. Another thing to note is the stay intructions are not included in this book. Stay making is so involved in and of itself, that one will have to find another book for that. Maybe Lauren will release a book on it in the future? 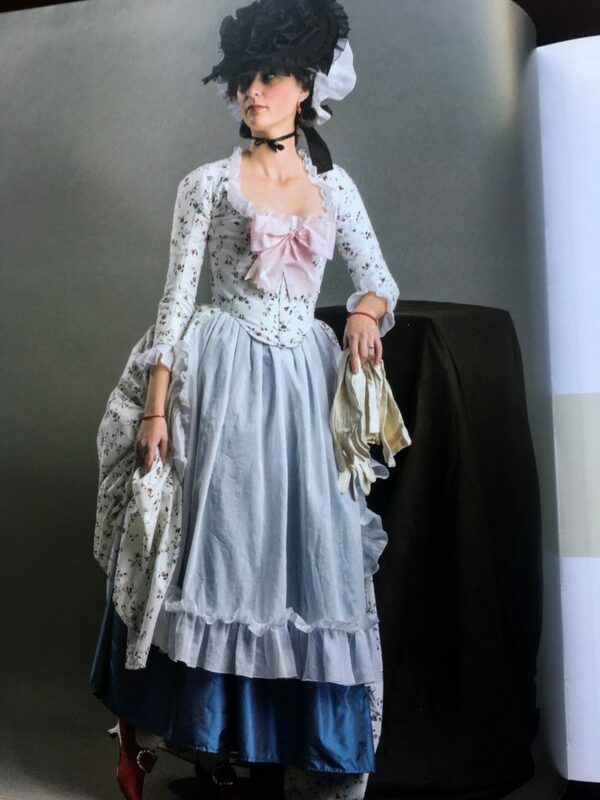 I’ve never sewn a stay myself, but I did attend a few workshops at Costume College, the historical sewing convention held yearly in Los Angeles, and the amount of work and detail that can go into a stay is to be respected. 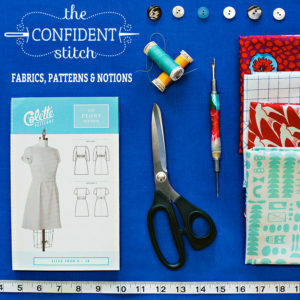 This book is a nice addition to any sewing enthusiast’s bookshelf. 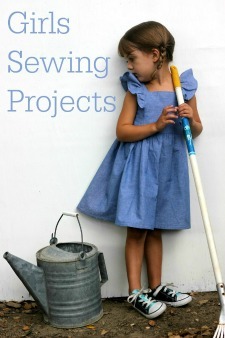 Even if one were not to sew any of the projects the book, it’s an enjoyable read. 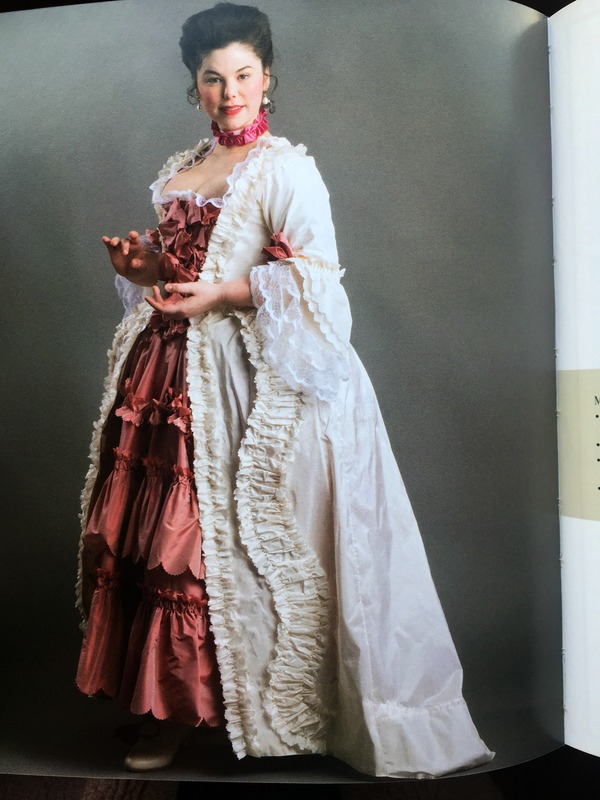 I learned so many fascinating details about 18th century dress from reading it. Tiny details are discussed and explained. From the petticoats worn under the dresses, to all the little accessories like caps and mitts and sleeve details and ruffle treatments. One of the details I found really lovely was the use of scalloped pinking shears to pink the edges of the silk sacque gown. A method common for finishing tightly woven silks. 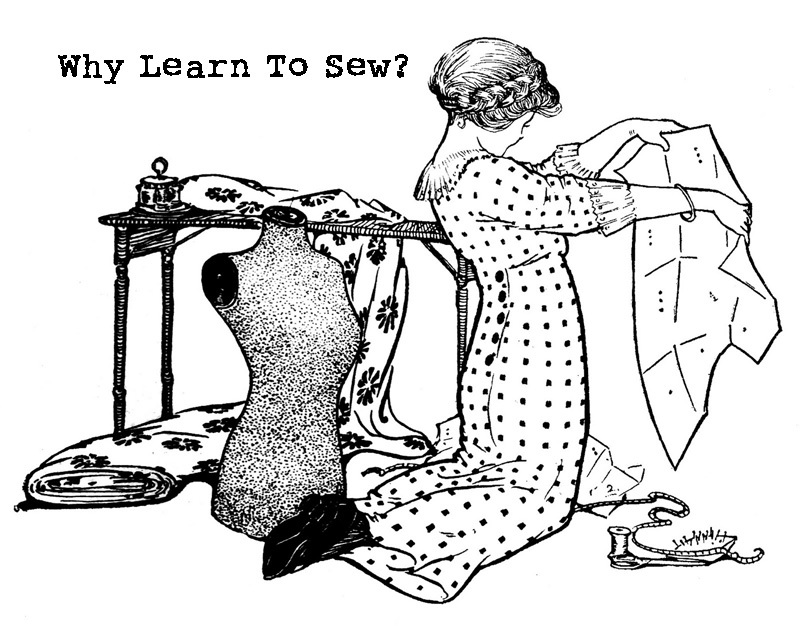 Ten Costume and Historial Sewing Blogs To Follow sewing for your girls – japanese pattern book review and giveaway! 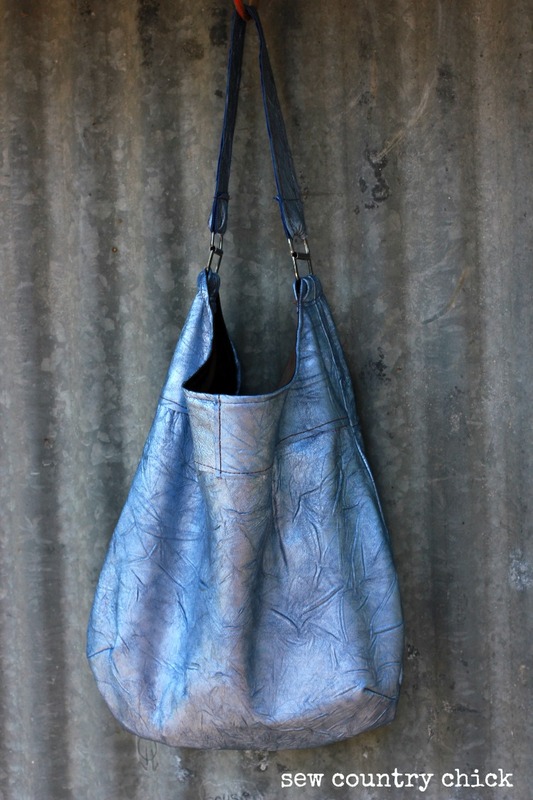 Happy Homemade Sew Chic: Book Review And Giveaway Sewing To Sell book review, giveaway & a purse I made from the book! Thanks for sharing the book with us. I love history and really appreciate the work and detail that go into the gowns, although I don’t think I have the patience to sew them. 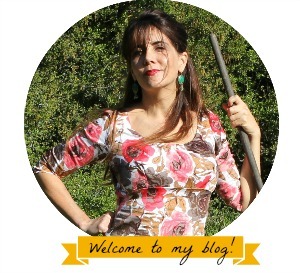 If you haven’t been to her site you might check it out. Her work is pretty amazing. I am happy to hear you all were not personally affected by the California wild fires. Have a wonderful holiday.